Homemade ragi powder is one of the most nutritious food that is given to almost all babies in South India from 6 month onwards. For my elder one, I started with store bought ragi powder (didn’t have the patience to wait for my mother to make home made ragi powder) and he cried so much after feeding and after 2 hours his potty was full of purple undigested ragi. Oh !! my poor baby, I felt so guilty and stopped giving him. Even after my mother made a batch and sent me, I was very dubious and reluctant to restart ragi again. But then knowing the nutritious benefits of ragi and not giving my son the nutrition he needed made me even more guilty. So I started off with just a tablespoon of ragi powder porridge. He was happily playing after that and fell to a sound sleep. Since then I gave the home made ragi powder once in every 2 days till he was a year old. After 1 year, I gave him Ragi Dosa, Ragi Biscuits as finger food. Why Homemade Ragi Powder is the best? The baby will not be able to digest store bought powder. Some babies might develop tummy upset too. So it is always best to make it home, or buy brands that have sprouted dried & roasted powder. When Can I give my baby Ragi? Can be given from 6 months but never as first food. 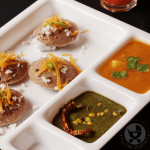 Ragi can be given after introducing the first foods. 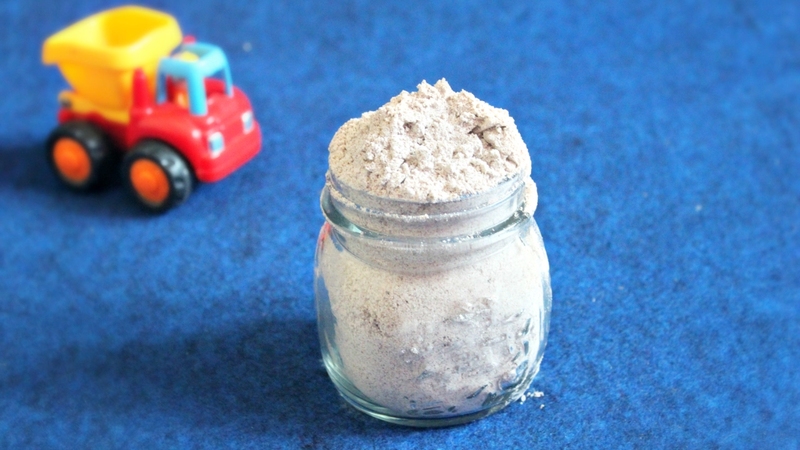 Homemade Ragi powder is ideal for babies. 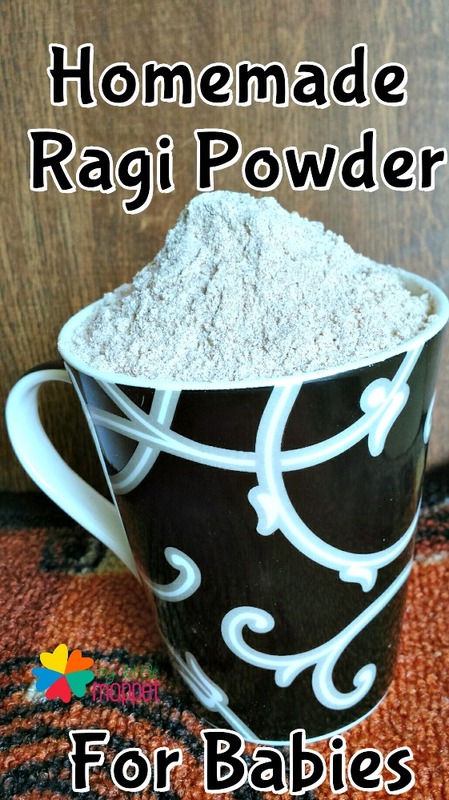 How to make Homemade Ragi Powder for Babies? 1. Soak the Ragi for 12 hours. 2. Wash the Ragi well in running water. 3. Take the Ragi in a white cotton cloth and make a potli. 4. Keep the potli in a cool place. 5. It will take atleast 12 hours for the sprouts to grow. 6. After you see the sprouts, transfer the ragi to a plate. 7. Dry them in shade for 5 to 6 hours till they are completely dry. 8. Dry roast the sprouted ragi in a kadai. 10. Grind them to a fine powder either with blender at home or in a commercial mill. 11. If you are using the blender at home, seive the ragi powder several times to get a fine powder. For making a porridge, mix 2 tablespoon of ragi in water without lumps, boil over medium flame till the ragi powder is well cooked. Soak the Ragi for 12 hours. Wash the Ragi well in running water. Take the Ragi in a white cotton cloth and make a potli. Keep the potli in a cool place. It will take atleast 12 hours for the sprouts to grow. After you see the sprouts, transfer the ragi to a plate. Dry them in shade for 5 to 6 hours till they are completely dry. Dry roast the sprouted ragi in a kadai. Grind them to a fine powder either with blender at home or in a commercial mill. If you are using the blender at home, seive the ragi powder several times to get a fine powder. For making a porridge, mix 2 tablespoon of ragi in water without lumps, boil over medium flame till the ragi powder is well cooked. Fruit Purees can be added for sweetness. But the ragi got soaked for more than 12 hrs …. almost for 17 hrs…. Is it ok…or I shall have to do the recipe again…. You can use the same ragi dear. I have store bought ragi atta. Can I use that to make ragi porridge for feeding my 9 mo ? Yes dear, but please make sure that it’s clean and from the trusted source. The ragi kanji becomes very watery after sometime. Can you please advise why that could be ? It is thick in consistency after cooking. But after 10 minutes or so , it turns very watery. That’s the nature of ragi porridge. It’s consistency change a bit after some time. Hi mam..I gave my son sprouted ragi powder which i prepared at home..first 2 days he accepted nicely..third day he passed motions which showed undigested ragi..after a week i gave him again and same thing happened..is he not able to digest it…since i read it is one of the most easily digestable food for babies..please help. In some babies this problem do arises or they get constipated after eating ragi. The best solution for this keeping your baby hydrated. For each spoonful of ragi, 2 sips of water should be fed to your child. Baby should always be hydrated made to drink water/juice as much as possible. Hi, Loved your website and recepies . I have started ragi porridge for my little one past 5-6 days . As per your recepie I first dissolve the powder in water and then cook it. But still it becomes watery and not as thick as shown in your pics. please guide . You can try to keep water quantity a little less and also boil till the expected consistency is achieved. just wanted to know my 6months old baby got cold is it ok to give raagi ? Yes it is fine dear. My baby is one year old and his weight is only 8kg.He is achieving his mild stone properly. Is There is need to worry about his weight. Hi thanks a lot for this ragi ceri recipe.. May I ask why you mention that ragi must not be the first food for the baby ? Hi can we give ragi twice a day for 8 months old baby? 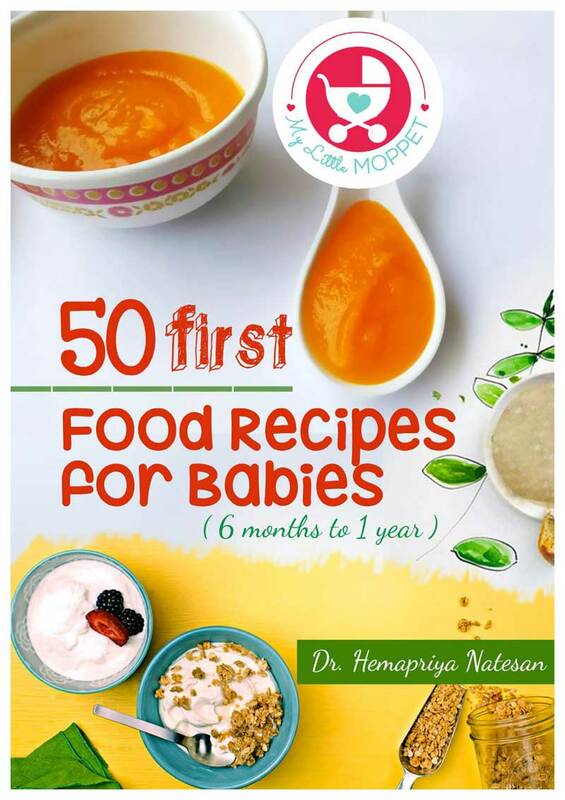 Hi doctor, I have started 1st bites ragi to my 5.5 months baby. After that she green stool later yellow, but it contains ragi in it. Is it normal?? Hi… even i faced this problem earlier. U need to add the water only while cooking it. If u add later it will get runny. If u feel it is too thick add hot water as required n stur vigorously. How to add water while cooking it can you explain? Won’t the lumps form? Thought we should make a paste separately with water then slowly add it to boiling water in a pot? I too get very runny watery ragi. You don’t feel full from it. Can someone suggest which dals and vegetables go well with it? As you have stated you can make a paste of the ragi with small amount of water. And then can be added into the boiling water and can cook. And when you keep the water in a pan then you can add the mix and can continuously stir it to avoid the lumps. The quantity of the food will depend upon your baby’s consumption of food. If you are taking 1 tbsp of the Ragi Powder, then you can take 100-150 ml of water needs to be taken for the food to cook. 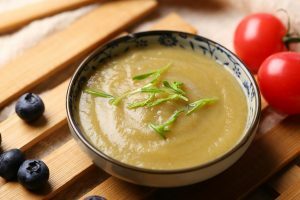 Whereas which vegetables goes with Ragi, you can add carrot,Capsicum,peas,cauliflower,moongdal,Egg Yolk etc can be added made. my daughter is 11 month old.her birth weight is 3.2kg.now she is 6.8 kg.please suggest me how to increase her body weight.but she is very active.and she is not eat properly. Hi dr Hema, thanks for the recipe. 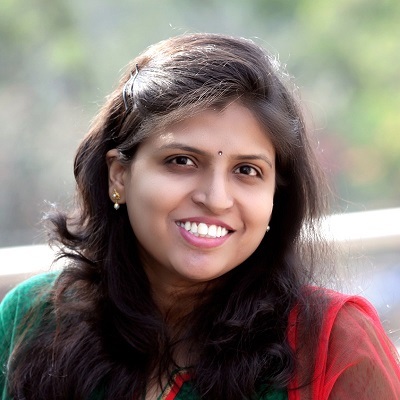 Your website is so helpful in critical phase of babies..i.e., starting solids..with your guidance it became easy..I have one doubt that…I don’t prepare jaggery syrup. I have organic jaggery powder at home and I just add 1tbs powder to any of porridge per day…is it ok to use powder or do I need to make the syrup..n daily how much quantity we can add to baby food. Could you send me some links/information on remedies/ diet etc for children with Asthma? I really wish to include Ragi in her diet,but unfortunately it causes cold. Can you help please? When we can start giving sweet potato ??? Hello doc, i recently bought 24mantra organic ragi powder. I want to know is it ok for my 15months old daughter . 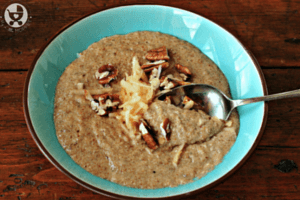 One more doubt ….can we add soaked badam paste stored in fridge to ragi or any other porridge ..not exceeding its content more than 1tsp ….please help. My baby is now 7 months old. 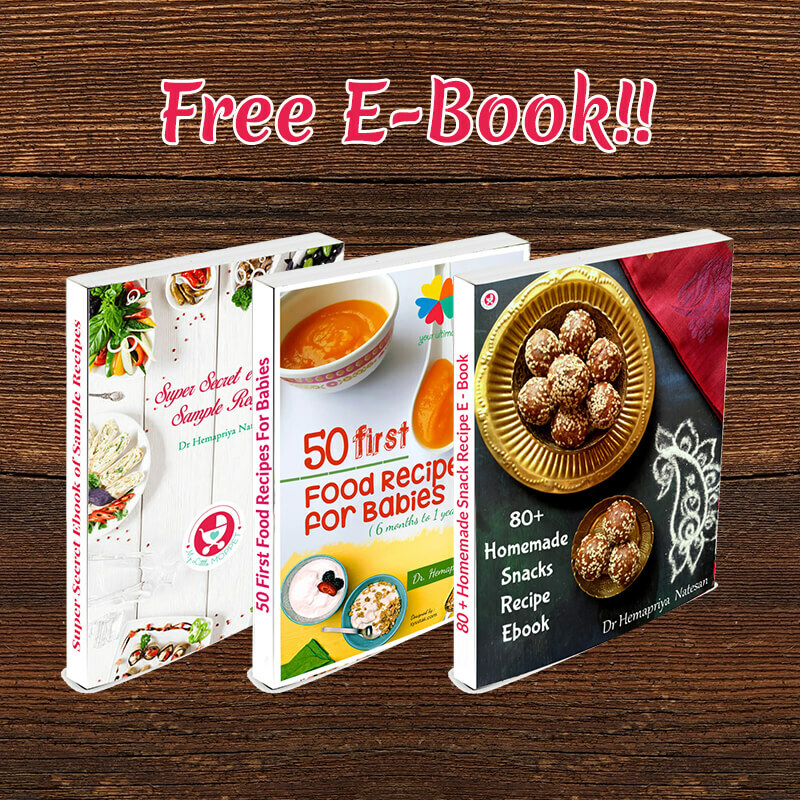 Thanks a lot for your recipes as they are of immense help. I have bought ragi powder from store n sieved it and My baby is 6 n half months old .can you please suggest me if I have to roast it and add water with Jaggery syrup or no need to roast n continue. With ur advice i have started givng my 6m old rice kanji. 1. Shuld i start ragi aftr she cmplts 7m? 2. Can i skip the sprouting part n make the pwdr? If done so shuld i soak ragi for 12hrs? 3. Can i use a normal seeve for seeving? 5. If yes can i jst dilute it in water n add by straining it or boiling is reqd? Hello, I have just started giving Ragi seera made with jaggery water to my 7 mo old. Her poo has hardened. IS it ok. Can I give her daily and how much quantity to give? Can we add cooked raagi with canatapoule or muskmelon purée? 1. 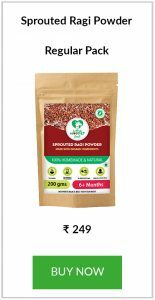 I have bought Organic sprouted Ragi powder from organic store. In that it is labelled we can give that for 6months baby. Shall i give that to my baby or do i need to prepare at home . 2. While preparing instant mixes like Ragi mix, Rice mix , Rice dal mixes, etc is it always need to toast the grains ?. My mom told toasted powder is not advisable for babies since it may cause bloating, stomach pains etc . I would like to start Ragi porridge for my baby . She is 6 months old. But How can i make it sweeten. 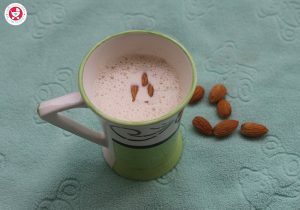 Usually i ll add apple or banana to other foods, but how can i give ragi porridge. Can i add Rock sugar or organic jaggary powder. Please help me to sweeten other foods like mashed rice , khitchdi, etc. Because my child spiitting out if the food is not sweet . Shall i always add fruits to these foods to make it sweeten or any other way. please help me .Because am in great confusion .some ppl around me telling can give sugar little amount no problem. Iam very conscious not to give sugar. 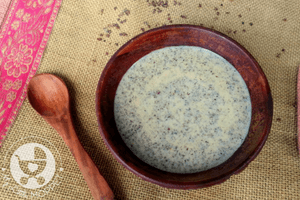 How long can we store this homemade ragi powder? My daughter is going to complete 6months soon. I intend to make it before joining work. My 9 month old loves ragi. She’s been having ragi since she was 6 months old. I prepared it then by sieving the flour through cloth. I am wondering if using just a sieve (instead of cloth) will be enough now that she is 9 months old? I give 1 tbsp jaggery syrup to my 6.5 month baby twice a day. Is it fine to give syrup 2-3 time a day? Then what should I use in porridge for sweetness instead of jaggery syrup to my 6.5 month baby?In porridge I use 1 tbsp jaggery syrup twice in a day. Pls reply soon. Hi hema i tried this ragi receipe as ur guideness in this post..
Hi hema shall i add saffron threads in porridges..ll it give fairness to babies? Is it advisable to give ragi porridge daily to my 9 month old baby . IS Ragi is safe in rainy and winter season for 6 month baby? We didn’t roasted the sprouted ragi but we have made it as a fine powder giving it in the commercial mill. Will it harm my kid if i giv without roasting sprouted rage and can we add any fruits puree for sweetener instead jaggery syrup. Kindly advice. Thank you. No I sprouted the ragi dried it then only gave it to commercial mill and it has come as a fine powder. Only I didn’t roast it. Thank u Dr. for sharing this recipe wt us. I’m going to be trying this asap. Bt just wanted to know for how long can I store this powder and should it be refrigerated? 1. For how long does the sprouted ragi need to be roasted? 2. 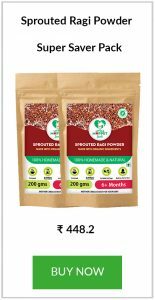 For how long can I store the ragi powder that has sprouted and ground? Do I need to store it in the fridge? 4. 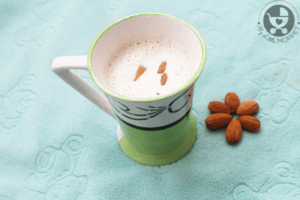 I am looking at the nutritional content of ragi and just browsing the internet, there are quite a few articles that indicate ragi os for weight loss (articles about weight in adults). If this is accurate then how does it work to help with weight gain in babies? A special amino acid, Tryptophan present in Ragi helps in curbing appetite. It has a higher rate of fiber compared to any other grain or rice. The high amount of dietary fiber combines with water and keeps the stomach fuller for a longer period of time. It is low in unsaturated fats that make it the ideal cereal for those looking to lose weight. The heaviness of the dietary fiber slows down the rate of digestion thereby keeping us fuller for longer with very less calories. Hi mam,how long should I dry roast??? I tried this powder. It came out well, Thanks but how to know if Ragi is cooked well? Hello Dr Hema,my daughter is 7 month old. I want to know that how much quantity my baby needed in 1 serving as she only eats 1 or more over 2 spoons. N then starts denying to eat. I’m worrying bat her health.plz suggest me. Please suggest a baby friendly Ragi cookies recepie. I am wanting to try giving ragi to our 8 month old baby and unfortunately I am unable to find whole ragi or finger millet in grocery stores here in San Francisco. I did find millet hulled in an organic grocery store (WholeFoods) but thats about it. Is ragi just plain millet or is Finger Millet something different? Do you know if anyone had any success buying it in the US? Thanks Dr Hema! As you recommended I do want to try to sprout and then grind millet at home instead of buying the flour directly. So in this case I should just look to buy whole millet grains and then use your method of getting the flour? Thanks Dr Hema – Will do. When you start solids you can offer your baby a few sips of water. This page is really help us for my baby. but i am bangladeshi for this reason we can not finding the ragi. please help me whats name are introduce ragi in bangladesh . In bangladesh, you speak Bengali na? 3. Also from which year it is advisable to giv cow milk. Some say 1 year and sum say 2 years. Can v giv avin pal. Also which colour packet and should v mix equal amount of water r just pure milk alone. 4. Since its boy baby few say to feed till 2 years. Is this fine. Or what do you suggest. Best website have ever seen. May God bless u.  We can see thousands of blogs but can’t believe everything but yours I had a feel of trust and got the feeling that I can confidently go ahead and feed my baby after completion of 6 months. He is 4 and a half months now. How do we make jaggery syrup and how much should we add. Is that ” panai Vellam ” u r talking abt mam. pls let me know if i can use any other ingredients with ragi to make a porridge like whole wheat or any other dal. Thank you Dr.Hema… your blog changed the whole diet of my LO… I could feed solids to my LO with confidence just because of your blog… and I could actually see the result in his weight… Thank You so much!! !